People love entertainment. But their tastes vary, giving movie trailer designers a wide variety of experiences to create. From dramas to fantasies to comedies, tastes and genres are as diverse as audiences themselves. Yet there is a consistent theme throughout all movie trailers. They all tell stories. Trailers must set expectations and excite people about the movie they represent, whether it features gun-toting gangsters or squishy yellow Minions. We spoke with Brian Sherry of Immersion, who helped produce haptic-enhanced trailers for Jason Bourne, Minions, Ghost in the Shell, and Fast & the Furious, among others. 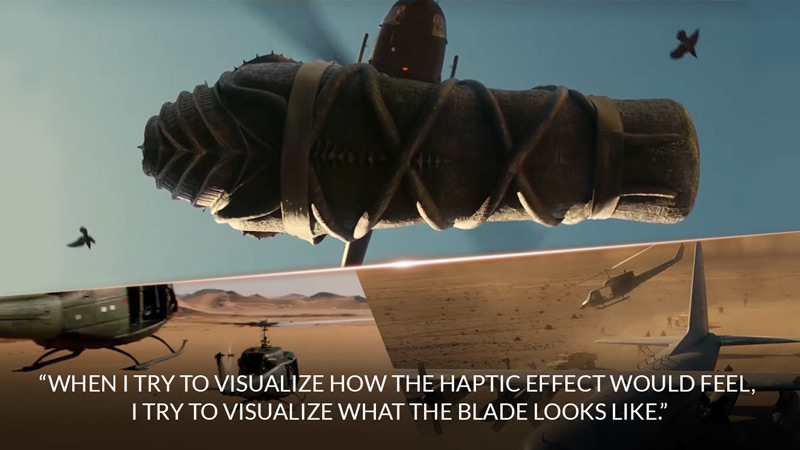 He said that effects are as varied as people’s tastes for entertainment, but the role of haptic design remains the same. 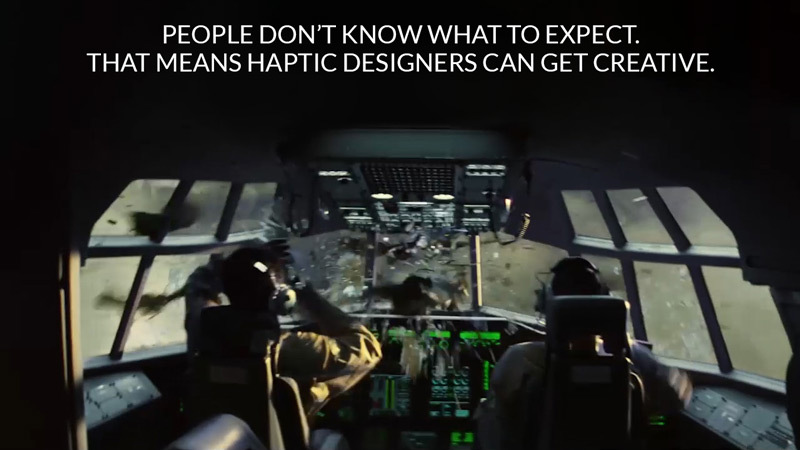 The best haptic design comes from sources that audiences can identify with — or, on the contrary, have never felt before. People can identify with natural textures like a gentle wind or crumbling rocks, which makes these sensations easy to recreate. They’re known quantities, and getting them to work either feels correct or not. Just as a good lighting director uses lighting to set mood — without drawing attention to the lights — good haptic designers use vibrations in concert with audio and video. Take helicopter blades, for example. Each effect gets a unique waveform. Unlike helicopter blades, breaking glass operates on higher frequencies. “You’d use more of a triangle wave design” for glass, Brian said. 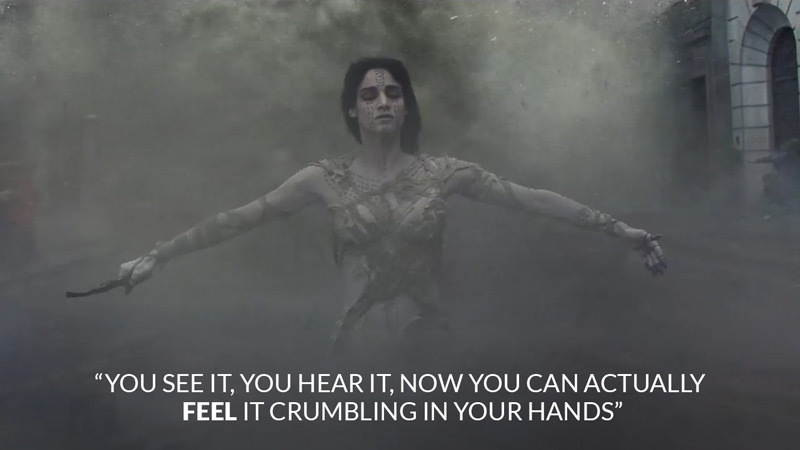 Helicopters, breaking glass, and fluttering birds all appeared in Brian’s favorite trailer, one produced for The Mummy. Unlike many spots, which reach 20 to 30 seconds, this trailer lasted a full two-and-a-half minutes — plenty of time for engaging haptics. At one point, birds attack a helicopter, smashing through its windscreen and causing general mayhem. Soon after, an evil spirit flies through ancient Egyptian temples which crumble in its wake. “You see it, you hear it, now you can actually feel it crumbling in your hands,” Brian said. But effects mean nothing without purpose. Brian pointed out that the best trailers themselves tell stories with pictures and sound. And in the end, it doesn’t matter if the story aims to thrill adults or charm children. Well-choreographed vibrations are an important tool to keep audiences entertained.